The wisdom of the earth is organized within the cyclical revolution of the seasons. Every process has its place, its time and its importance. There is value in youth and old age, in becoming and releasing, in birth and death. This is the wisdom of nature. There is no fight between light and dark, they both exist side by side to support and replenish the other. Each season is distinct with its own theme, set of colors, issues and experience of the life force. As the earth spirals through space, the rhythm of 4 creates the grounding structure for life to play out its dance. Spring is the morning of the year. The life force is strong and fresh. Life is expressed with a palette that is bursting with color. It is full of vigor and vitality. Spring is a creative period. Life is young and filled with ideas, ideals, promises, hopes and expectations. The energy of spring carries our hopes, desires and inspirations. The gushing waters of freshly molten snow, the cacophony of songbirds and the shower of petals against the bright blue sky creates the mood for this season of beauty, innocence and first love. And as things all do flow, spring gives way to the beautiful season of summer. Youth matures into adulthood. The projects started in spring are actualized and the flowers become fruit. Summer is a season of accomplishment. It is a peak time of the year; the sun is at its strongest and bathes the earth with its brilliant light. It celebrates the intensely creative element of fire. In summer the trees are laden, there is plenty, the days are long and the life force is established. After the glorious days of summer when the life energies are spent, the beautiful season of autumn begins. 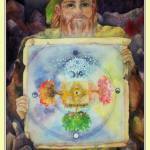 It is time to move toward the internal dimensions. The experiences of summer are reflected upon, preparations are made to let go and move into the profound state of winter. Animals are storing their food, trees are pulling in and days are becoming shorter. It is a time to let go. There is the truth that nothing is permanent. In the end the essence of the experiences, the internal components are extracted, and the forms are discarded. The trees will carry the memory and record of the year, but the physical expression within the fruits and leaves are released. Autumn is well represented by the sunset; a dazzling brief moment sent off in celebration of a day well spent. It is the period of old age, where one reflects upon life, love, joy, and sorrow. He reflects upon his life and comes to a place of understanding, insight and wisdom. Like the waning moon, the nights become longer and darker and the world prepares itself for deep slumber. Now begins the beautiful season of winter, the season of night. Winter is a season of rest, sleep, death and hibernation. It creates space to recharge, rejuvenate, reinvent and to connect once again to the deep layers of the soul. Without this phase, we would quickly burn out from the fires of summer. Life has a chance to inhale and receive. The earth takes in its experiences. It processes all the material of the year. The leaves, seeds, sticks and plants that have fallen are buried under the snow and they slowly decompose and merge back into the earth. There is connection and access to soul levels where you can experience and communicate with other dimensions of yourself. This is the dark time of year, ruled by the mystical new moon. The days are short, life is withdrawn and the element of earth presides. It is time to close the eyes and open to the vision of the soul, to move into no time and dream within the infinite realms of the cosmic mind. The energy and inspiration that is gathered in this season is what is expressed when life starts again in spring. This perfect cyclic rhythm is carried out every day; morning, day, evening and night. . .in every moon cycle; waxing, full, waning and new. . .in every year; spring, summer, fall, winter. . .in the directions; east, south, west and north. . .in the elements; air, fire, water and earth. . .and in the stages of life; youth, adulthood, old age and death. Deep within the crystal caverns of the earth, in her akashic storehouse, are recorded the laws of nature. A wise dwarf who is a keeper of this realm presents an ancient scroll where these laws can be read. 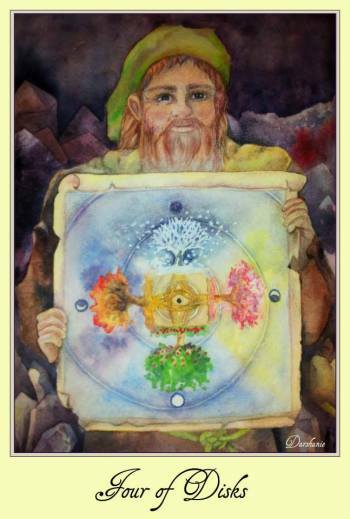 When you get this card, reflect on your activities and harmonize them with the natural rhythms of nature. This card asks you to join into the cosmic pulse of life. Your world needs grounding and support which the universe can provide once you follow its wisdom logic where everything has a time and a place. Connect to this natural rhythm and you will get plugged into the funky groove of our spiraling spaceship earth. This entry was posted in Disks, Tarot on January 9, 2015 by darshanie.